The other day, I blogged about the changes in the Dec-16 release for FCCS. As it turns out there is a bug that was fixed (well partially fixed) that people might want to know about. It relates to reporting currencies. First a little history. Back in August, I submitted an SR which turned into a bug. The issue was for the currency dimension, specifically when you create a reporting currency. To do that, I went into the currency dimension and simply checked the reporting currency box for the currency I wanted. The next time the Essbase database was refreshed, I had a new reporting currency. Nifty. The member name for the new reporting currency is CAD_Reporting, no problem, The Alias for the member is "CAD" Hmmm the alias is the same as the member name of the input currency. If you tried to retrieve data in Smart View with Aliases turned on, an error popped up about an ambiguous member name can't be resolved. I know what you are saying (I can read your mind). Just remove the alias from Cad_Reporting and all will be good. Nice idea, but unfortunately, we can't edit the aliases for reporting currencies. No error, but now which is which? 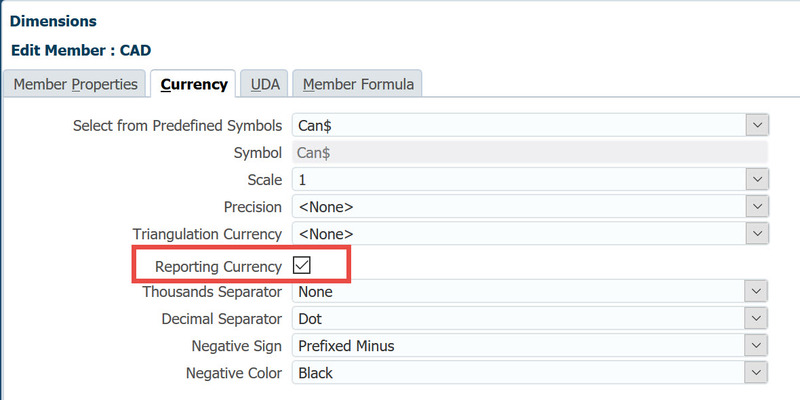 Both say CAD, but the one on the right is really the alias for CAD_Reporting and the one on the left is the member name for the CAD input currency. So at least now we don't get the error retrieving the data, but it will be a bit confusing for the users. They really have to put in "CAD_Reporting" and not the Alias CAD even when they have aliases turned on. It should not be too bad until they completely fix it as the input currencies are not really used much, but expect to get questions about why what appears to be the same intersection provides different results. In my blog post A Glimpse into FCCS I talked about haw alternate rollups are not allowed in the Entity dimension because of how Oracle is doing the elimination logic. Well, one of the big improvements with the latest patch is the ability to have alternate rollups. "One entity can have multiple parents, and contribute differently to each parent. These members are called “Partial Shared” entities, where only a part of input data is shared across all instances of the entities". Move of rate override members from the Data source dimension to the Consolidation dimension. Although not spelled out, this was a bug we encountered where historical rates were not being applied properly. This change allows different override rates to be applied to different source members. Three new members have been added to the consolidation dimension FCCS_Overrides, FCCS_Rate Override, and FCCS_Amount Override. In Data Management, FCCS is now a source system- With this change FCCS can be used as a source for other cloud systems like PBCS( Planning Cloud Service,) EPBCS(Enterprise Planning Cloud), ARCS(Account Reconciliation Cloud Service) and PCMCS (Profitability and Cost Management Cloud Service). In addition, you can push data to a flat file for use in other systems. Data Management now also supports multi-period loads. This allows you to have periods on the columns in your data file. There were a couple of bug fixes as well. dealing with member tagged as saved assumptions and Flow not accumulating over time and Data entry intersections not always clearing for parent members. As you can see the FCCS team has been very busy adding needed enhancements. It just gets better and better.